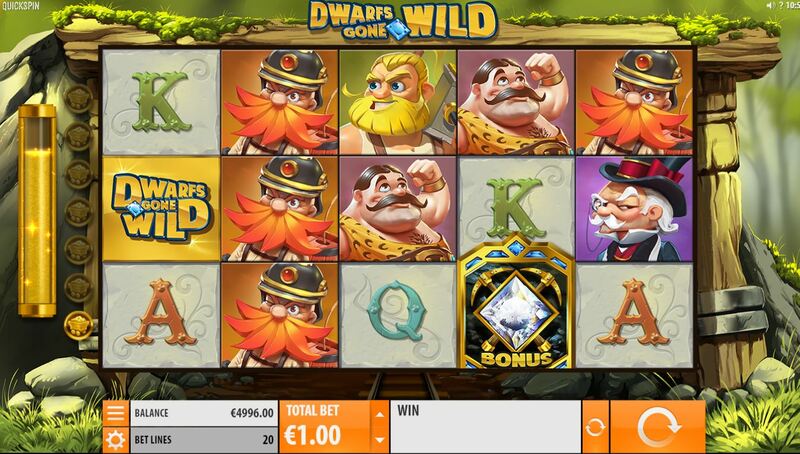 Dwarfs Gone Wild slot is one which you may also see listed as 'Dwarves Gone Wild' which is J.R.R. Tolkien's version of the plural of 'dwarf' and is actually in the Oxford English Dictionary - just though I'd clear that one up first! Spelling aside, unsurprisingly this game is centred around the number seven, Wilds and our vertically challenged friends as the name suggests. 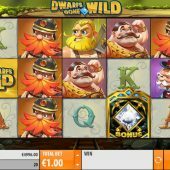 Like other Swedish slot developers, Quickspin tend to produce many games with juvenile graphics and in that respect this is just as bad as Fairy Gate and Spinions Beach Party although many players will overlook this if the game mechanic is decent - so will these Dwarfs end up shortening your bankroll too? We are immediately treated to some ludicrous jaunty cartoon-style music upon opening the game which persists throughout and pay 20 coins to play Dwarfs Gone Wild's 20 lines. With the exception of Snow White symbols are stacked on the reels in cartoon form and single Wilds can appear on all reels. The game seems to have a lot going on when viewing the opening screen and instructions but has actually got quite a simple mechanic as we'll discover. The Wilds and Snow White both pay 60x bet for a full 5-of-a-kind line and yes, it's a thinly concealed take on the famous Disney film in all but name, ahem! The seven dwarfs pay 25x for the top two, 20x for the next three and 16.25x for the lowest two for a full line of 5, with the remainder being three card values all paying 5x. As with most Quickspin slots the bonus is triggered by scatters on the middle three reels, in this case a Diamond Brooch but here we do have a cumulative consideration too as you shall see. If you see the Mirror appear on reel 3, only in the base game, then 300 of the top-paying Snow White symbols are added to the reels and you get that spin and 2 re-spins for the chance of some big hits! Now I said earlier the number seven is important here and indeed it is - as well as the dwarfs and the fact you get seven free spins for the trigger, there are also seven Wild enhancements, one in respect of each dwarf. Rolling Wilds - a Wild is randomly placed on reel 3, 4 or 5 and will move left one position each re-spin, similar to the Wild in the base game of Netent's Jack And The Beanstalk. Spreading Wilds - one Wild added anywhere which will expand to either two or four adjacent positions. Throwback Wilds - simply two to five randomly-placed Wilds. Full Reel Wilds - one or two random reels turn Wild. Free Wild - after a free spin places a single Wild in the optimum position. Extra Spin - three, four or five extra spins added. Win Multiplier - one or more winning spins get a random 2, 3 or 5x multiplier. These features do not occur randomly in the base game and you only get the ones you've accumulated given during the bonus. You will start with one Golden Minecart and a meter to the left of the reels. This is added to every time a dwarf win occurs. When the meter is full you get a second Minecart and so-on up to a maximum of seven. The amount of Minecarts you have when triggering the bonus determines your enhancements - if just one it can still activate multiple times in the bonus and it's possible to see more than one on the same free spin.